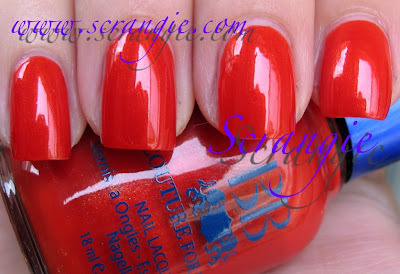 BB Couture has released a set of six hot rod themed polishes for fall. Actually, I'm not 100% positive that this is the official fall collection, but it's one of them! This isn't the fall collection (Thanks, Kim! :D) This collection is limited edition- very limited - only 100 bottles of each color! It's also an OverallBeauty.com exclusive- you can't get this collection anywhere else! Cherry Baby. Red with red glitter. 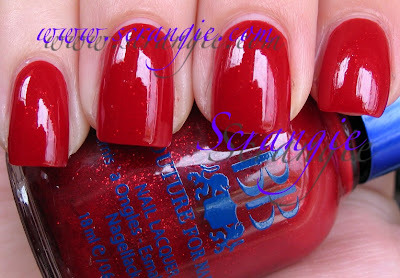 This is a cool cherry red with sparse red glitter. In the bottle it look like it might be similar to China Glaze Ruby Pumps, but it's really not. You don't usually see the words 'subtle' and 'glitter' used together, but this is a very subtle glitter. It's not in-your-face sparkly, but it gives a little added interest to an otherwise normal shiny red creme. Cruisin'. Light orange creme. This is a light orange shade that's not pastel. Would you call this shade 'Creamsicle'? It's creamy orange, very pretty. I did have a bit of trouble applying this one- it was a little streaky and needed four coats to become even. The color is worth it, though! I love how this looks! Hot Spot. Red-Orange with gold shimmer. This one fits quite well with the hot rod theme- it reminds me of painted-on flames! 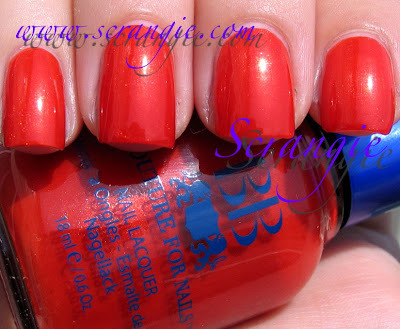 It's a medium saturated orange that leans very red and it's covered with a decent amount of subtle golden shimmer. Little Deuce Coupe. Soft yellow creme. This is a really lovely shade of yellow, I don't have many like it in my collection. Like Cruisin', it's light but not totally white-out pastel. This looks lemony to me- lemons and ice cream. This one also gave me some application issues, but not the ones I was expecting! Yellows are normally thick and streaky- this wasn't. It was thin and fairly streak free, but it was sheer so it needed four coats to cover the bald spots. And then, of course, I had to go and stick my finger in it before I took the picture so that's why it looks all funky and lumpy... Sorry... >.< Lowrider. Frosty purple. Low-ri-der drives a little slower.... This lowrider is also very frosty. It's a frosty metallic purple that looks like it could be a close relative of the long-discontinued OPI Pike's Peek-A-Boo Purple. For a frosty metallic, the brushstrokes visible after application are minimal. It has a really nice smooth formula. Nitro-Injected. Frosty medium blue with shimmer. Another frosty metallic, but this one has little speckles of shimmer embedded in the polish. Don't get me wrong, it's a nice color, but the only things I like frosty are my beverages and my snowmen. I just don't think frost finishes flatter anyone's hands- they age even young hands. Despite the frosty finish, I really like this color itself. Sparkling beachy blue. The shimmer flecks this has are interesting... I don't have another polish like this... Though they kinda sink into the frosty metallic polish when it starts to dry and make it look speckled. It would probably look fine with a topcoat. The formula on these was decent. The two cremes gave me a bit of trouble, but the rest were problem-free. The formula has three-free tendencies, often being thick and runny at the same time. One interesting thing to note about BB Couture polishes is that they claim to be 4-in-1- base coat, treatment, color and topcoat all in one polish. I always use a basecoat/treatment and a topcoat when I wear these, but it's interesting to note that these polishes dry to a very shiny finish even without topcoat. 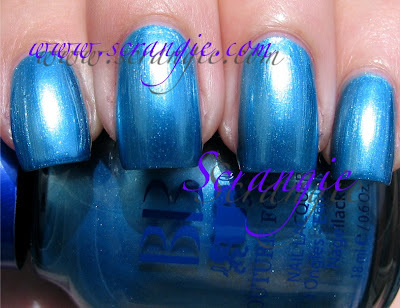 Some shades are shinier than others- all of these pictures are taken without topcoat. I'd still recommend using one- I can't live without my quick dry topcoat. Overall, this is a really cute collection. All of the colors have a fun retro feel to them. A good varitey of shades and finishes as well- not all cremes or all shimmers. Two cremes, one shimmer, one glitter and two frosts/metallics. I love to see a variety of shades and finishes in any collection and this one is spot on. 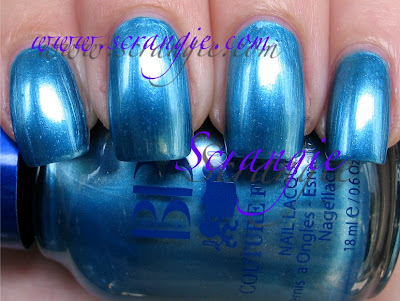 One thing I mention every time I review BB Couture for Nails polishes is still true- they're not afraid of colors. They're not afraid to be adventurous. They're not afraid to play with different finishes and textures. I adore that about them. They've done pretty much every color of the rainbow in a variety of finishes. They have glitter galore and they also have multiple greens. Of course, that makes me a happy camper. But, honestly... For such a small color range (I can't imagine they have over 200 shades... I've never counted but it seems fairly small) they have the most variety and some of the most interesting and unique shades I've seen. I say it over and over again... I love variety. It's okay to have a million light pinks and reds as long as there are other colors to balance it out, and BB Couture does just that. They balance. They have something for everyone. That makes me very happy. Like I mentioned above, the Hot Rod collection is limited edition and available exclusively at Overall Beauty. They can be purchased as a set or individually. There were only 100 bottles of each color made, and I know that only 60 or so remain of certain shades. Oh, I need Cherry Baby! I like the yellow one too, but four coats, I don´t know if it´s worth it. That's a nice looking collection! Thanks for sharing them all and giving me something else to want~ha-ha! Thanks for swatching these! I so agree with you. BB Couture has really nice color variety. This collection is gorgeous, thank you for sharing this with us! Thanks for taking the time to do sure a great review! I love the fact you are honest and don't sugar coat any issues you find. My personal fav at the time is Little Deuce Coupe. And for anyone who may not know this fact, my kid sister of SolSisters help come up with the ideas with me and BB Couture to create these colors. Her favorite? Hot Spot! She was complaining there wasn't enough oranges in the BB Couture collection. And with BB Couture love for colors well the rest is history! Dana Cerise, I hope they never change! Long live variety! TY for swatches, Scrangie! I bought this collex, but have been too lazy or busy to swatch. I really REALLY like Cruisin'!!! This was the first time I'd bought the whole of any collection, and I am so in love with them. Little Deuce Coupe is a stunner, and for a yellow was not bad application. 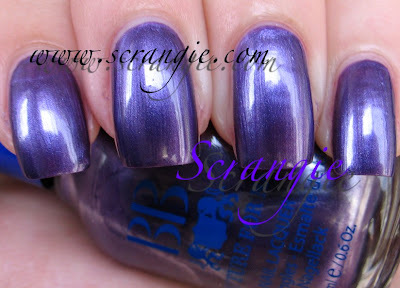 BB Couture has become one of my fave polish brands. I am slowly warming up to yellows and Little Deuce Coupe looks like I could pull it off without cringing. Obviously my thermometer needs to go a little higher to make me embrace yellows for personal wear. It's very pretty on you though. I fully embrace Cruisin'. That's a pretty, fun cup o' sherbet. I bought low rider and Nitro injected. NI is a bit frosty for my tastes but I'm sure it will look great with a matte top coat on it! I thought I bought the only two I "needed" but after looking at your swatches I'm wrong!! Wow I like Cherry Baby and Nitro-Injected especially. I bought Cruisin' this summer and FINALLY put it on this week. I love the color but I haaaaaaaaaaaaaaaaaate BB Couture's application brush. It's much too long and skinny.